NAYPYIDAW — Burma laid on a spare-no-expenses opening ceremony for the Southeast Asian Games on Wednesday, part of efforts by the government to convince the world it’s open for business following a half-century of brutal military rule and isolation. 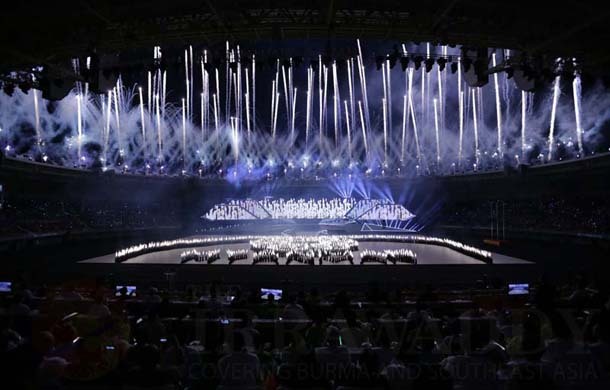 The four-hour extravaganza, complete with parades, fireworks, singers, dancers and a sound-and-light show, was held to loud cheers and bursts of applause in a packed 30,000-seat stadium. It is one of nearly a dozen arenas built for the games in the surreal, remote capital of Naypyidaw, which was carved from the jungle by former leaders of the junta just a few years ago. Some people traveled for days in hopes of getting tickets to the opening ceremony—held a full 11 days after the games got underway—but not everyone felt comfortable with the money and energy invested, especially on infrastructure. The nation of 60 million remains one of the world’s poorest, with only a tiny portion of the budget going to education or health. “I’m proud we can hold these games, but it’s hard to understand such a grand event,” said Moe Zaw, a 33-year-old who lives hand-to-mouth in a dusty village a few kilometers from the stadium, as he prepared to drop a fishing line into a little creek. Burma last hosted the SEA Games, the largest sporting event in the region, in 1969. There has been little star power this time around, with all the premier badminton players at the Superseries Finals in Malaysia. Several countries decided to scale down their presence after the host scrapped sports like tennis and gymnastics in favor of traditional, cane-ball competitions like chinlone, and obscure martial arts forms like wushu, to boost its chances at winning golds. The tactic appears to be working as Burma leads the medal table with 18 golds, trailed by 10 for Vietnam and six for Thailand. For the country, an international pariah under successive dictatorships, the games are more about showing the world how much has changed since President Thein Sein installed a nominally civilian government two years ago. As part of sweeping reforms, it has released thousands of political prisoners, including 44 on Wednesday, and freed up the media. With US and European sanctions largely lifted, multinationals like Coke and Unilever are slowly starting to test the waters. Determined to make sure everything goes smoothly throughout the 22-day event, the government has tightened security, with police carrying automatic weapons lining multilane highways that crisscross the sprawling capital, and bomb-sniffing dogs being walked around venues. To avoid the embarrassment of empty seating, thousands of students also have been bused in for the competitions, said Chit Win Maung, a sports commentator. The turnout for Wednesday’s official opening, however, appeared to be genuine. “Well, I’m a little disappointed,” said Pe Ray Mya, a 29-year-old who spent a full day driving from eastern Burma with her husband in hopes of attending, only to find out all the tickets had been snatched up. Associated Press writer Aye Aye Win contributed from Rangoon.